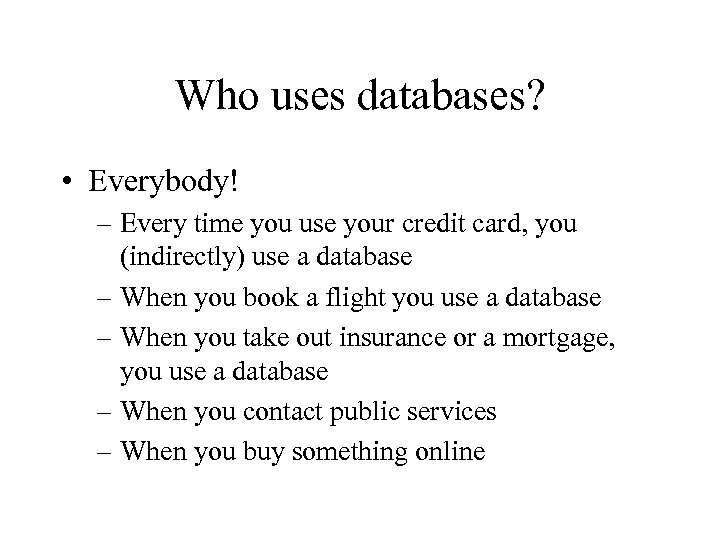 Example (cont. ) 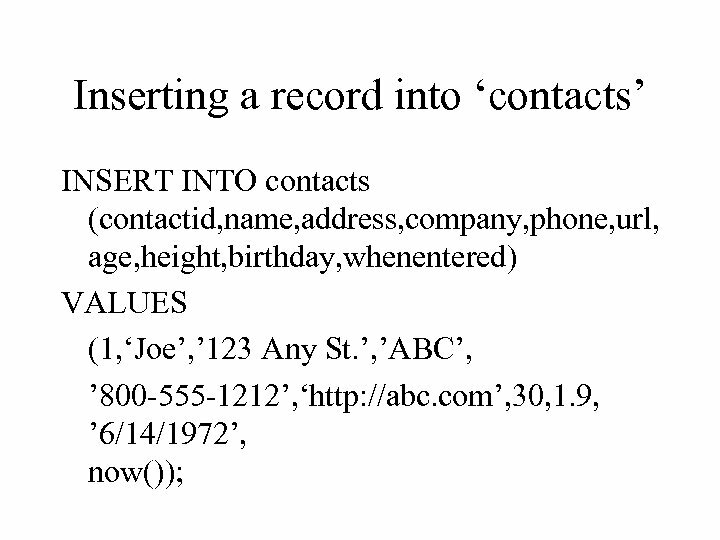 Contacts Id Name Company Address Phone Zip. 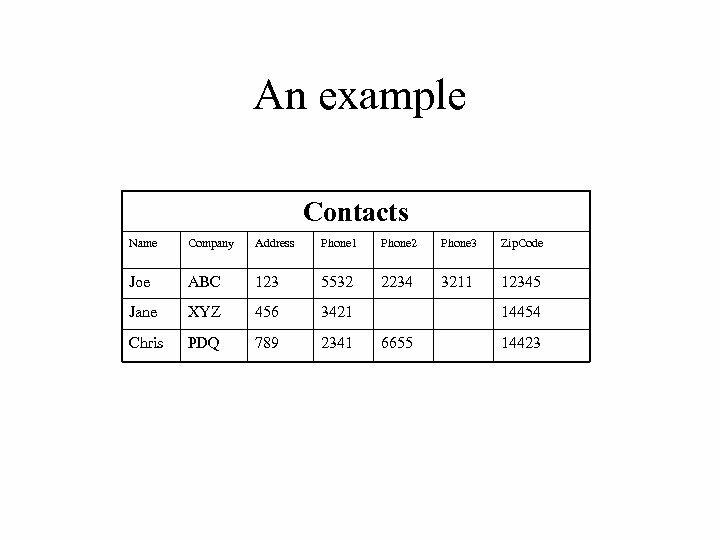 Code 1 Joe ABC 123 5532 12345 1 Joe ABC 123 2234 12345 1 Joe ABC 123 3211 12345 2 Jane XYZ 456 3421 14454 3 Chris PDQ 789 2341 14423 3 Chris PDQ 789 6655 14423 Could be a Data. 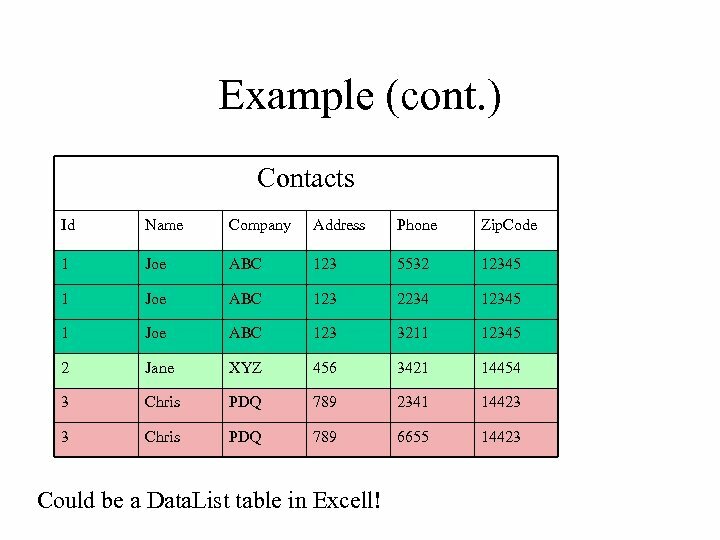 List table in Excell! 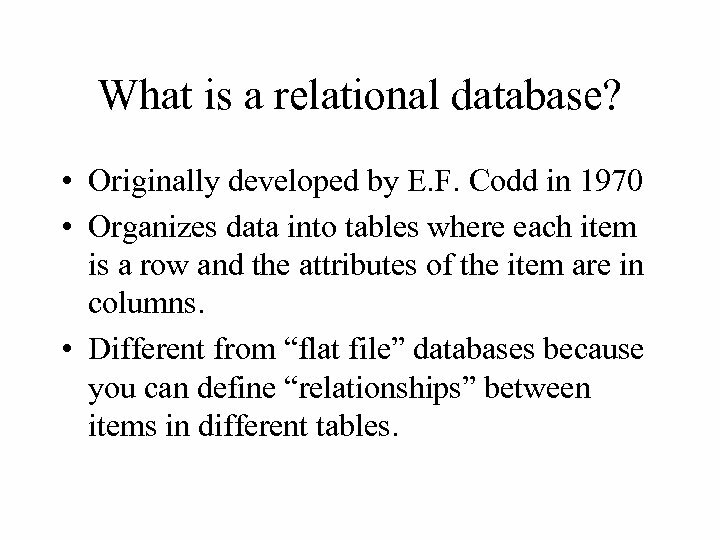 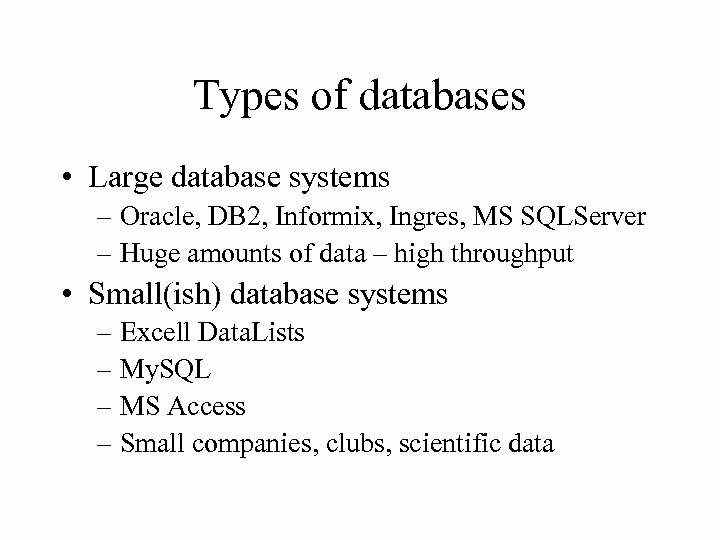 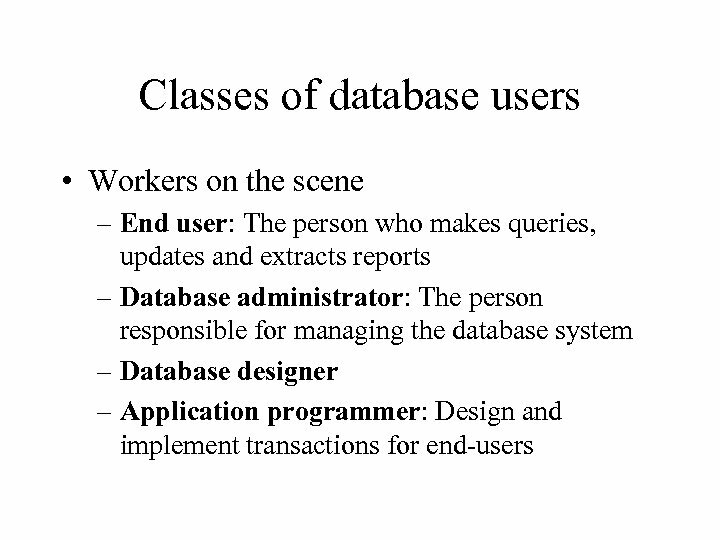 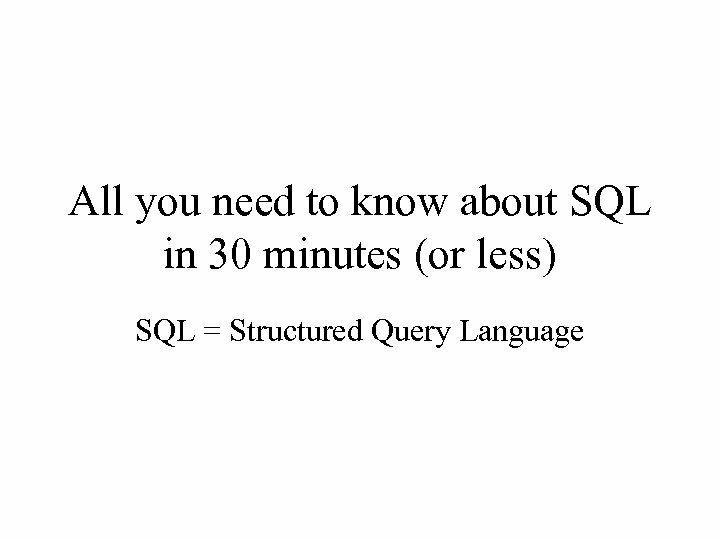 What is a relational database? 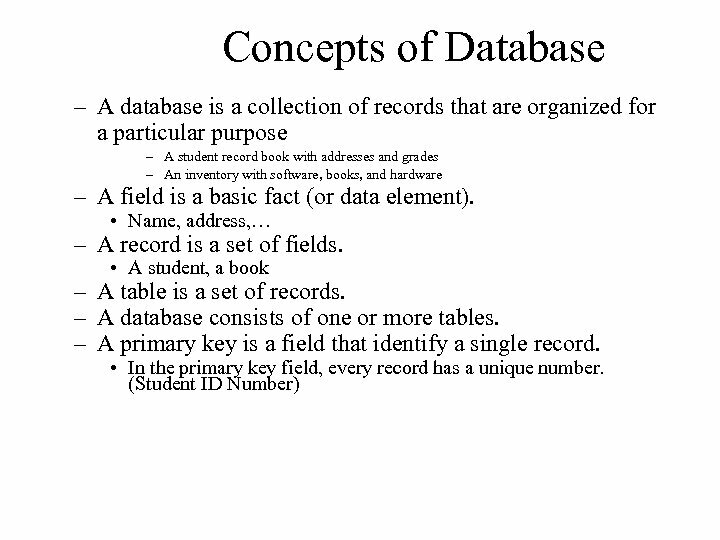 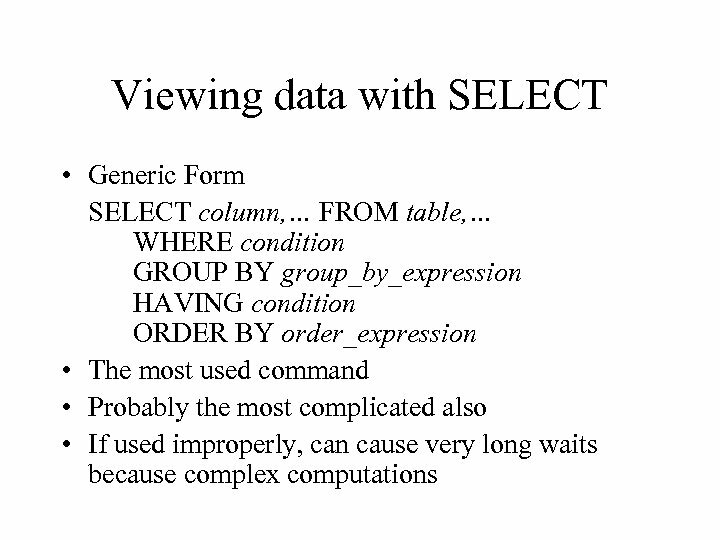 • Originally developed by E. F. Codd in 1970 • Organizes data into tables where each item is a row and the attributes of the item are in columns. 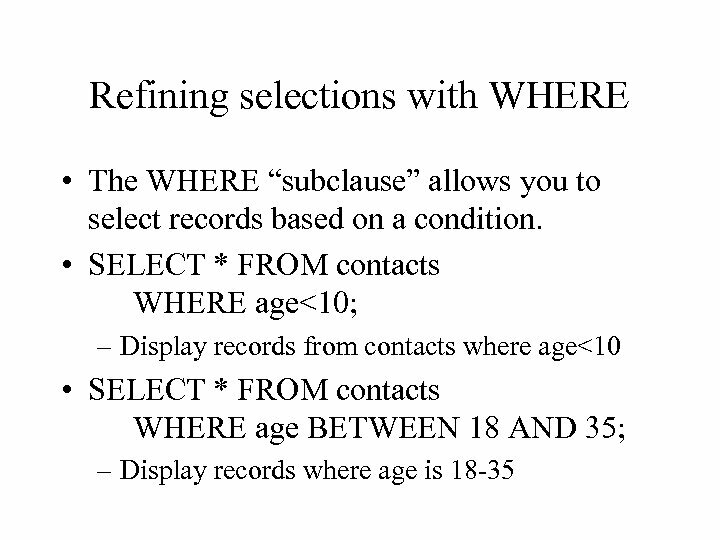 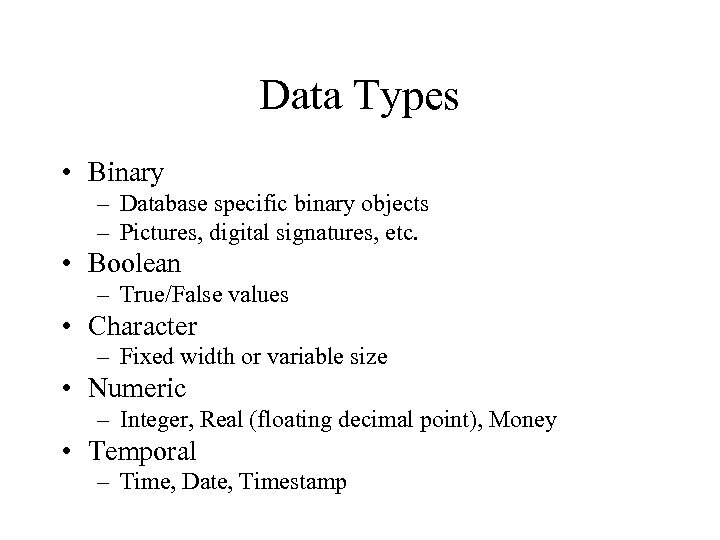 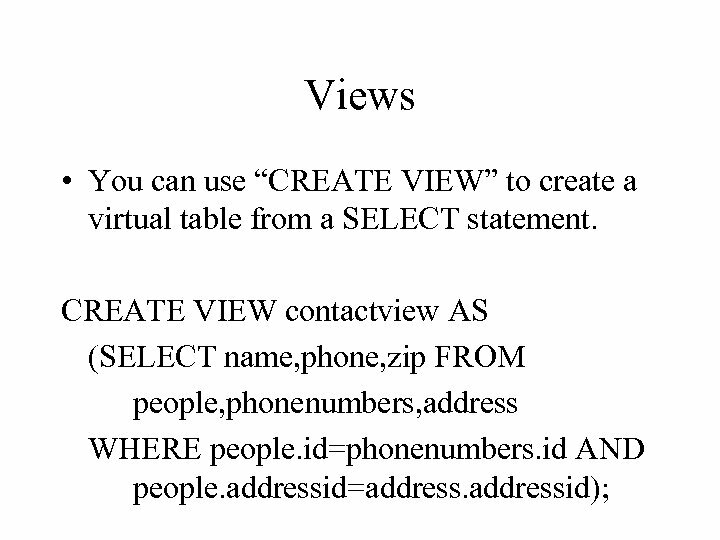 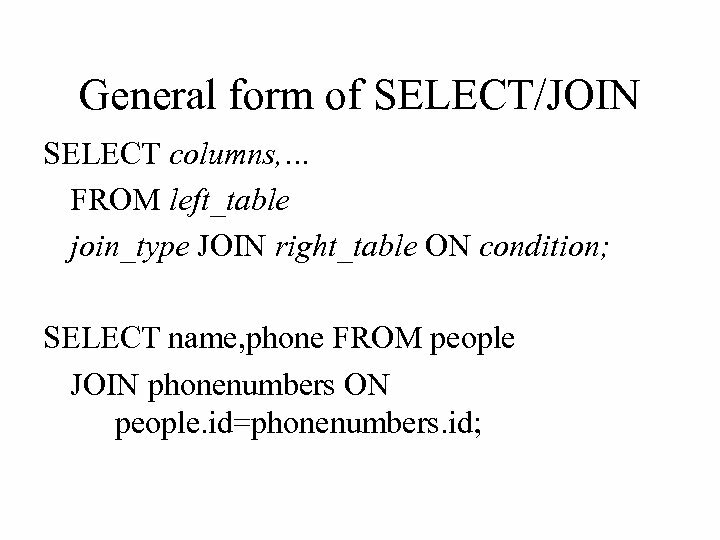 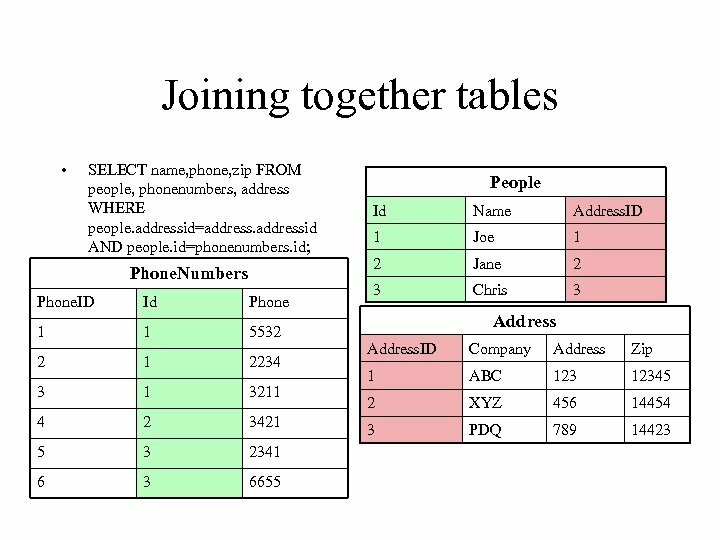 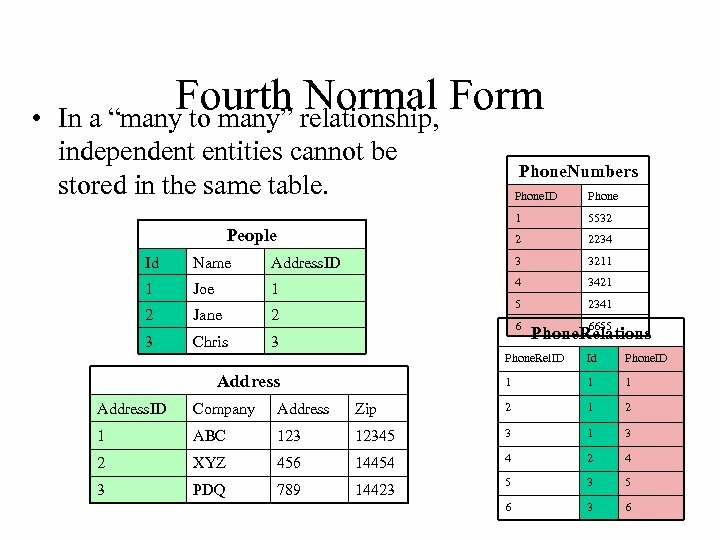 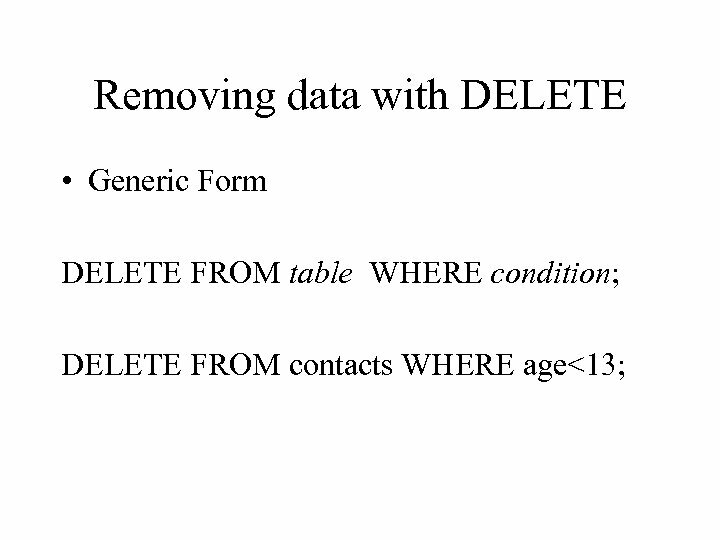 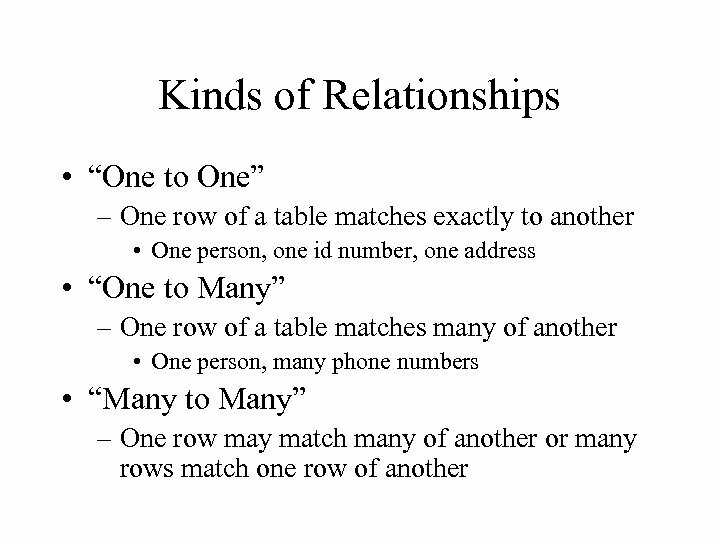 • Different from “flat file” databases because you can define “relationships” between items in different tables. 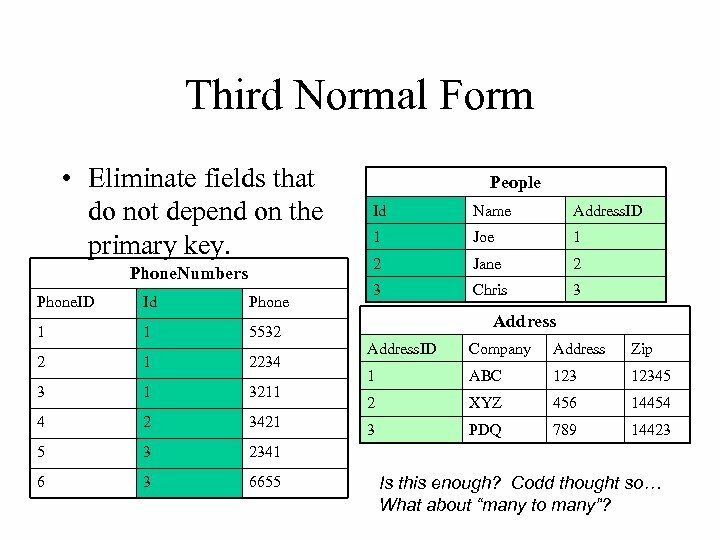 Third Normal Form • Eliminate fields that do not depend on the primary key. 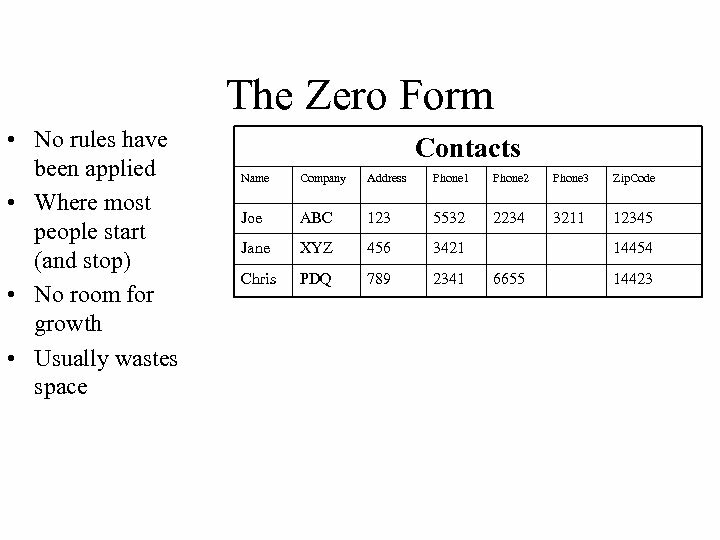 Phone. 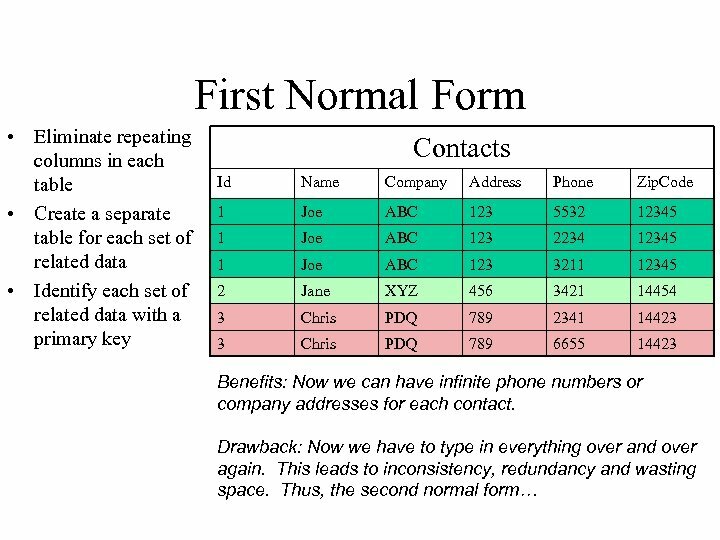 Numbers Phone. 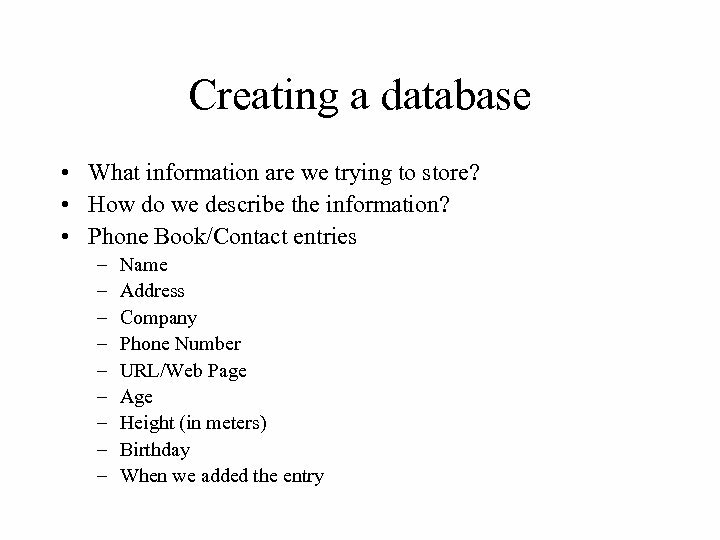 ID Id Phone 1 1 5532 2 1 2234 3 1 3211 4 2 3421 5 3 3 6655 Id Name Address. 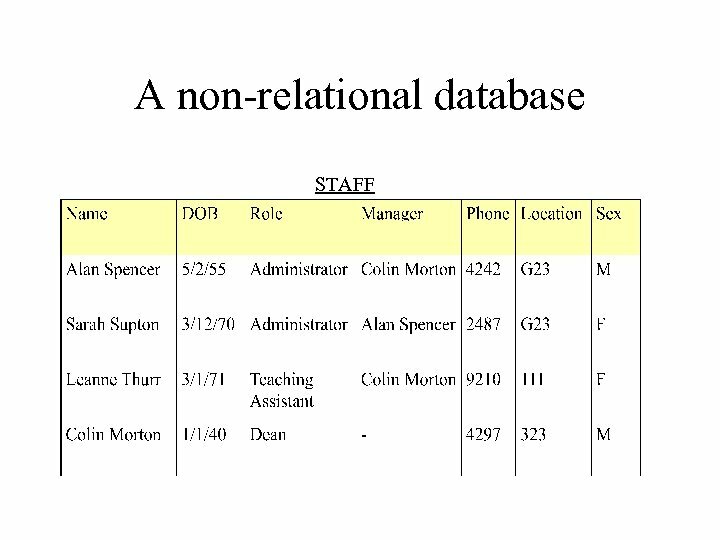 ID 1 Joe 1 2 Jane 2 3 Chris 3 2341 6 People Address. 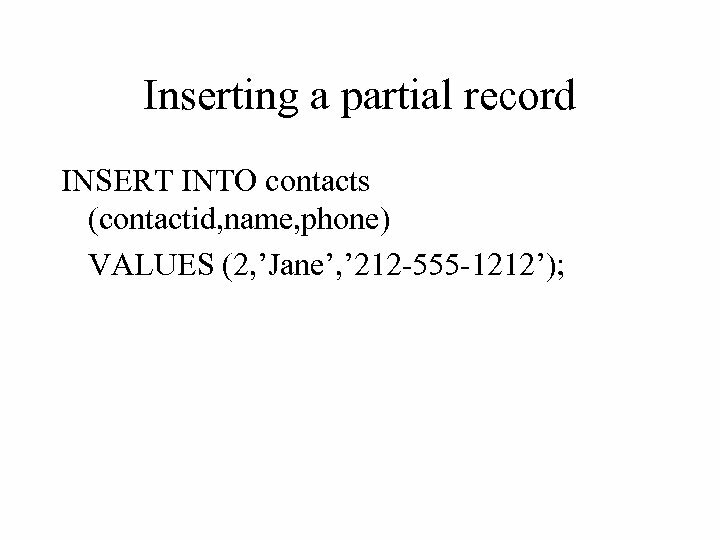 ID Company Address Zip 1 ABC 12345 2 XYZ 456 14454 3 PDQ 789 14423 Is this enough? 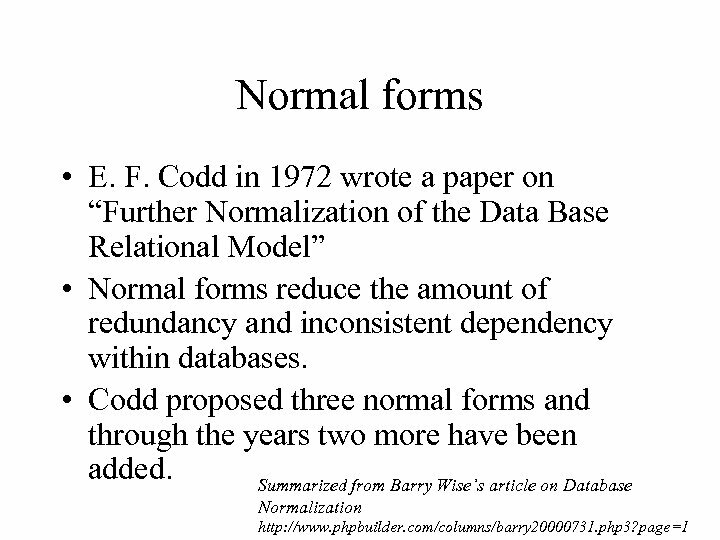 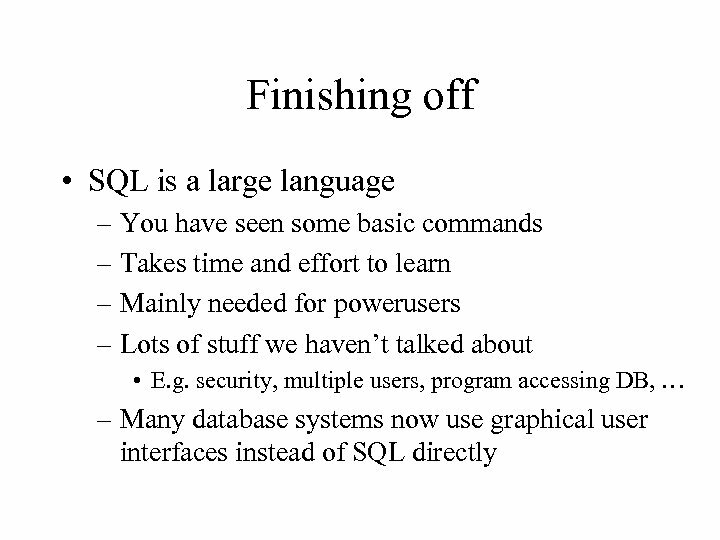 Codd thought so… What about “many to many”? 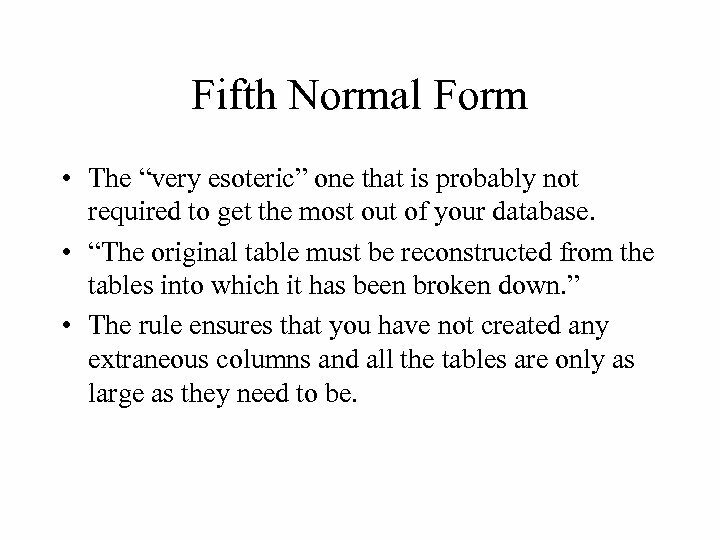 Fifth Normal Form • The “very esoteric” one that is probably not required to get the most out of your database. 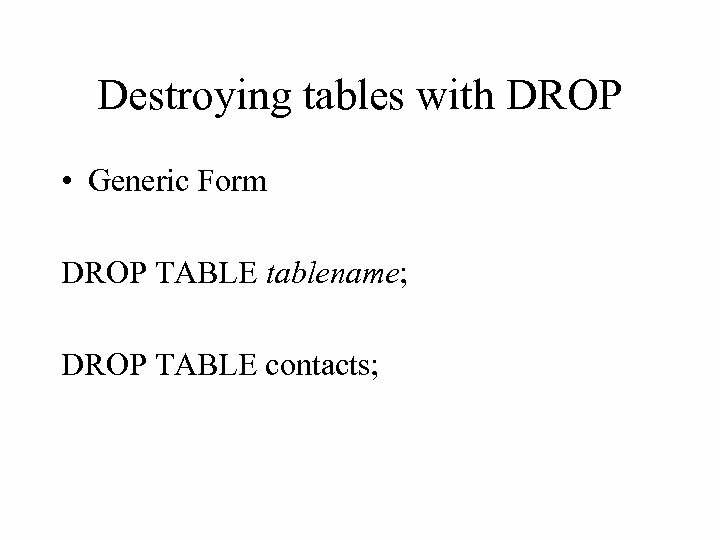 • “The original table must be reconstructed from the tables into which it has been broken down. 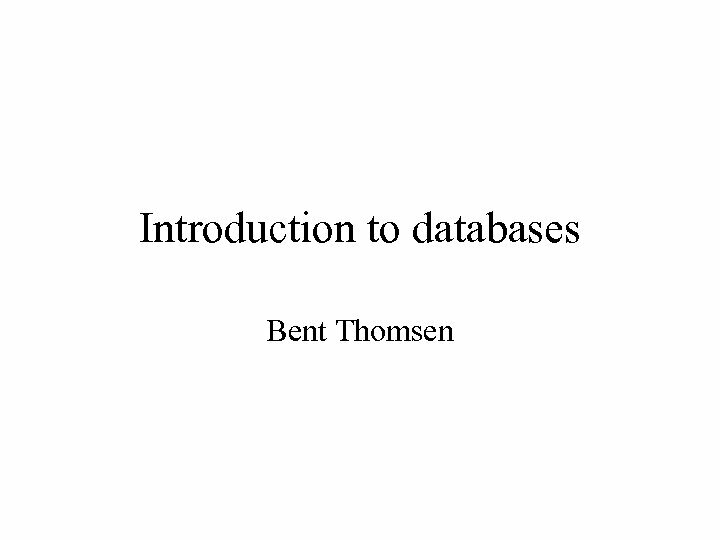 ” • The rule ensures that you have not created any extraneous columns and all the tables are only as large as they need to be. 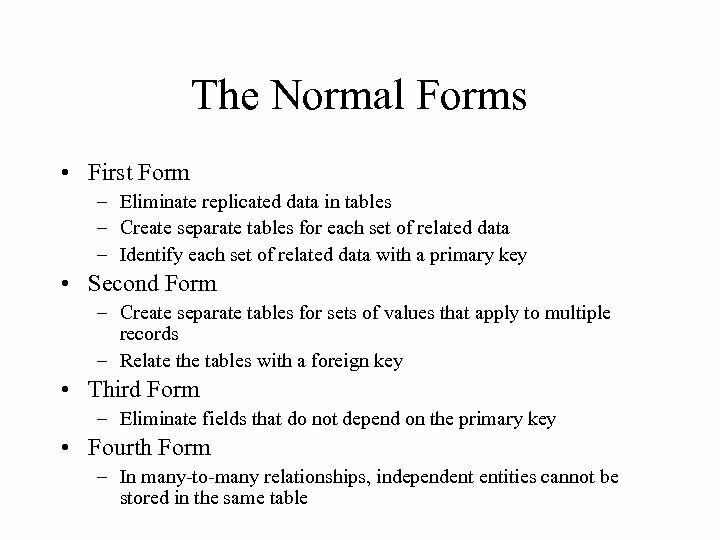 Why normalize? 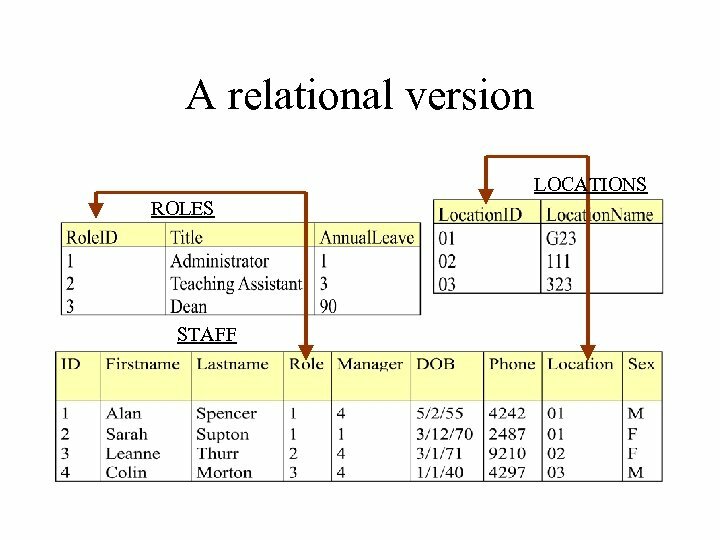 • • Increases the integrity of the data Reduces redundancy Improves efficiency Although normalization can be hard, it is worth it in the long run. 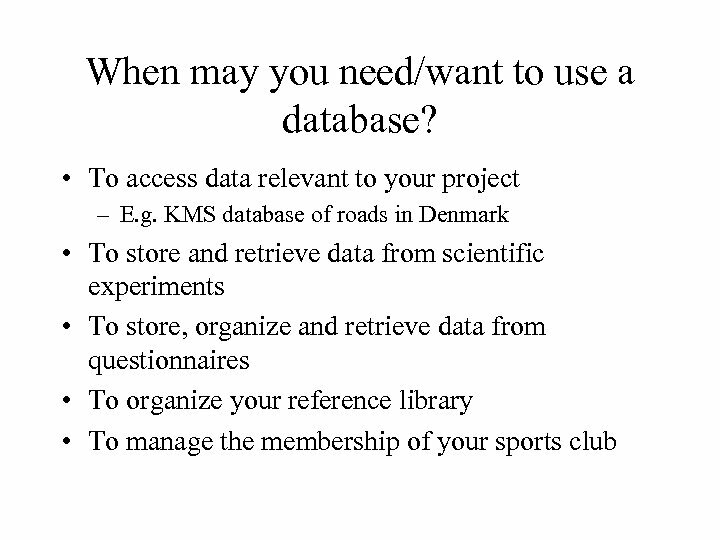 What do I need to remember? 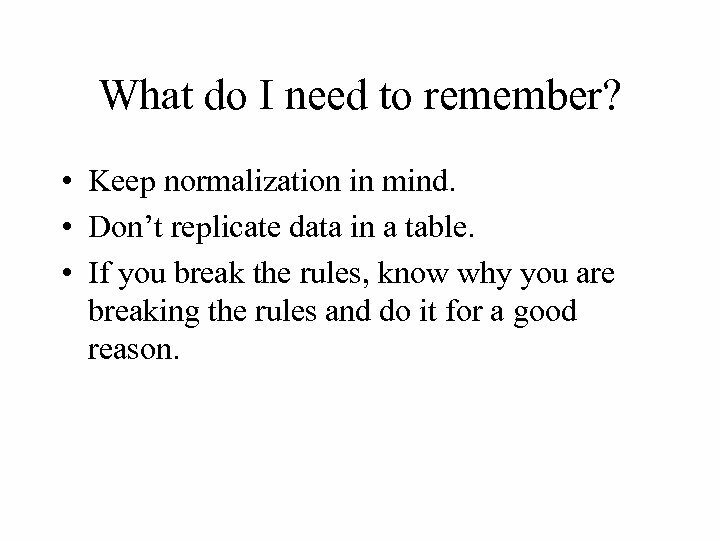 • Keep normalization in mind. 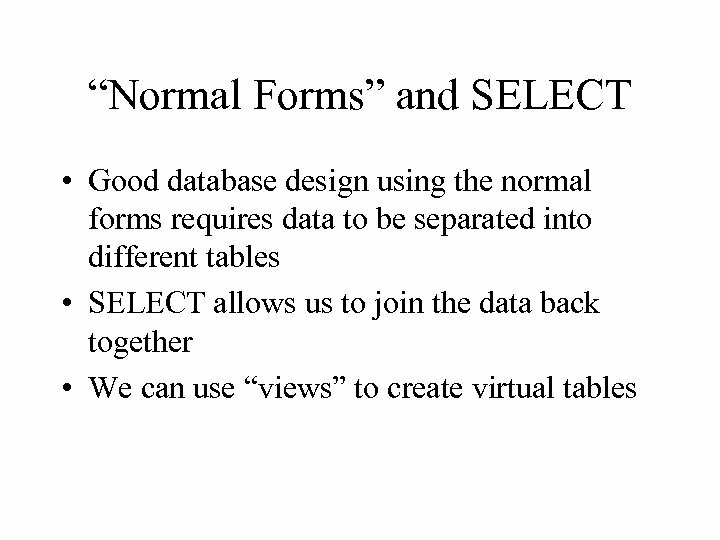 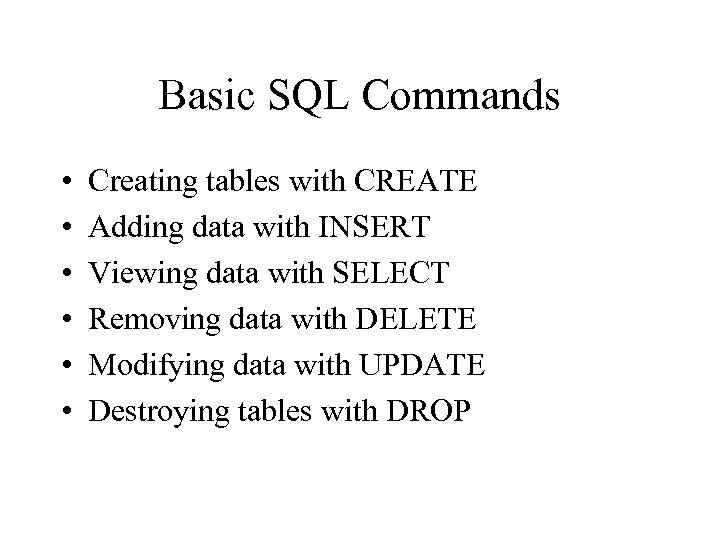 • Don’t replicate data in a table. 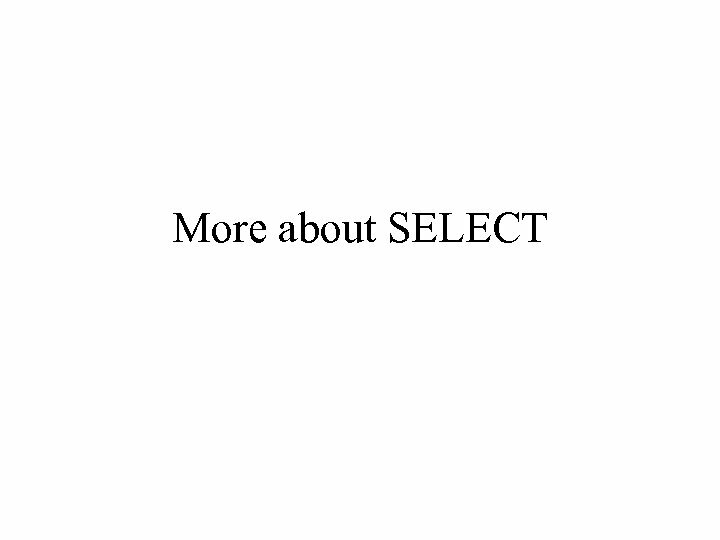 • If you break the rules, know why you are breaking the rules and do it for a good reason. 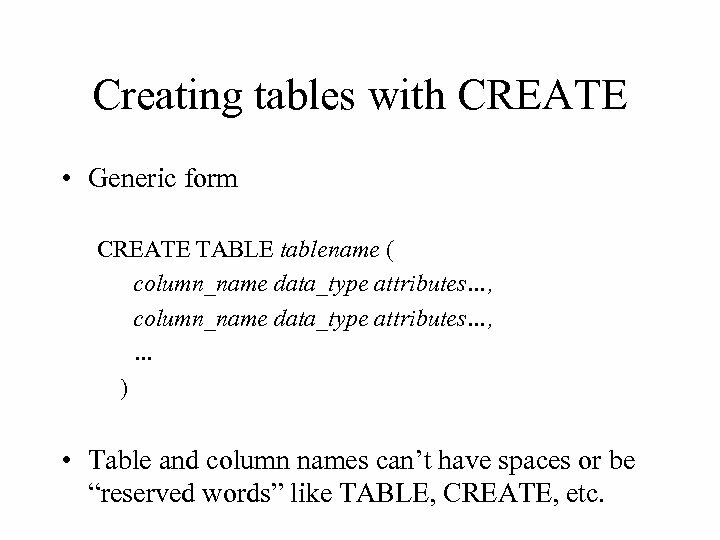 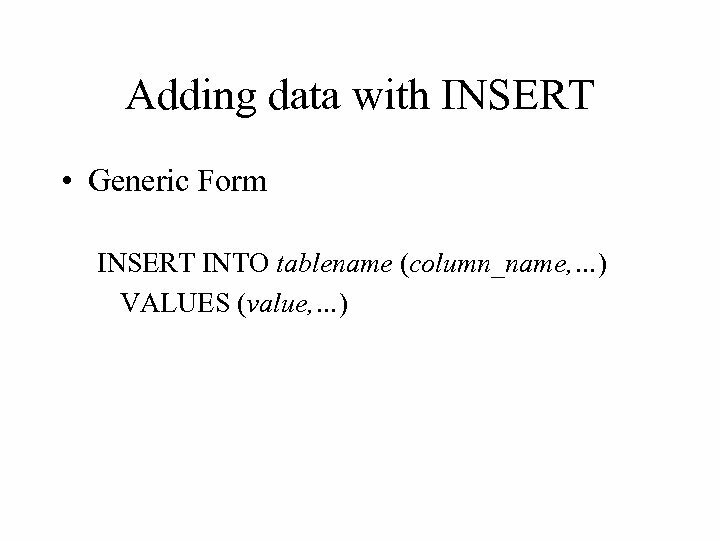 Creating tables with CREATE • Generic form CREATE TABLE tablename ( column_name data_type attributes…, … ) • Table and column names can’t have spaces or be “reserved words” like TABLE, CREATE, etc. 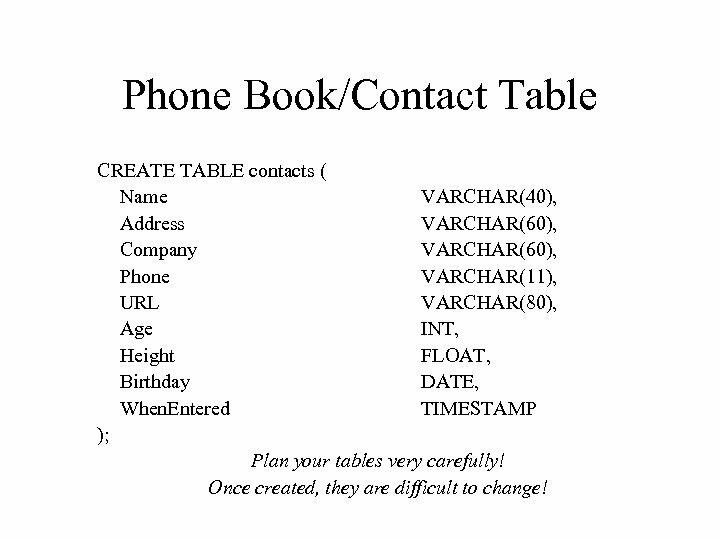 Phone Book/Contact Table CREATE TABLE contacts ( Name VARCHAR(40), Address VARCHAR(60), Company VARCHAR(60), Phone VARCHAR(11), URL VARCHAR(80), Age INT, Height FLOAT, Birthday DATE, When. 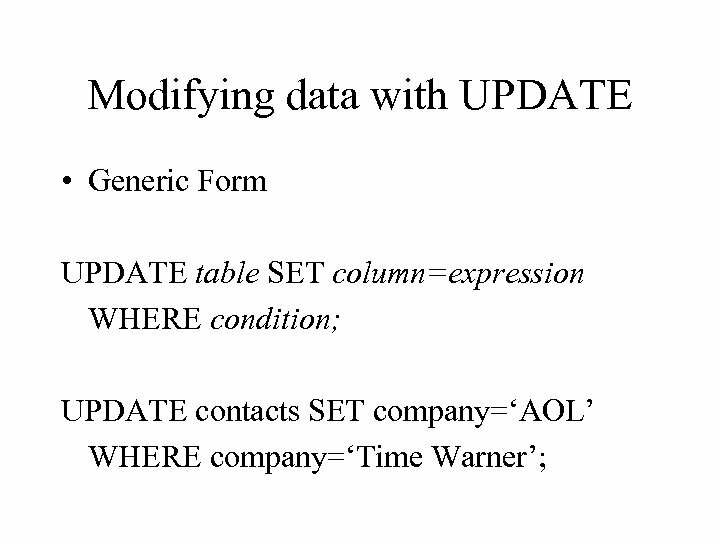 Entered TIMESTAMP ); Plan your tables very carefully! 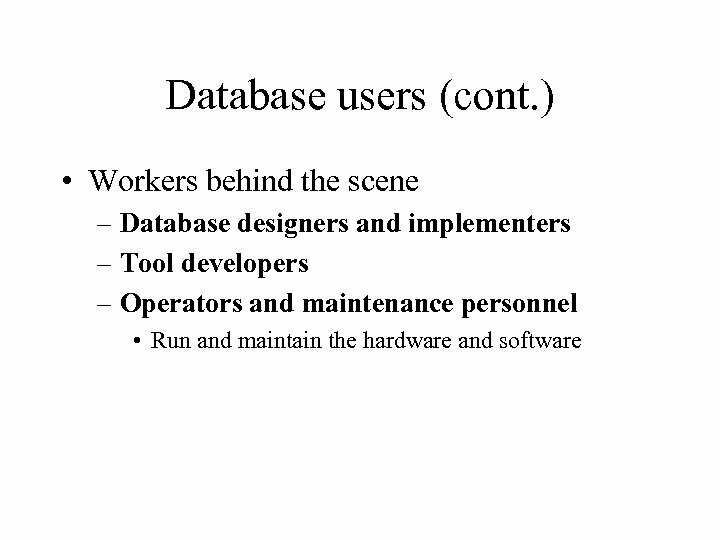 Once created, they are difficult to change! 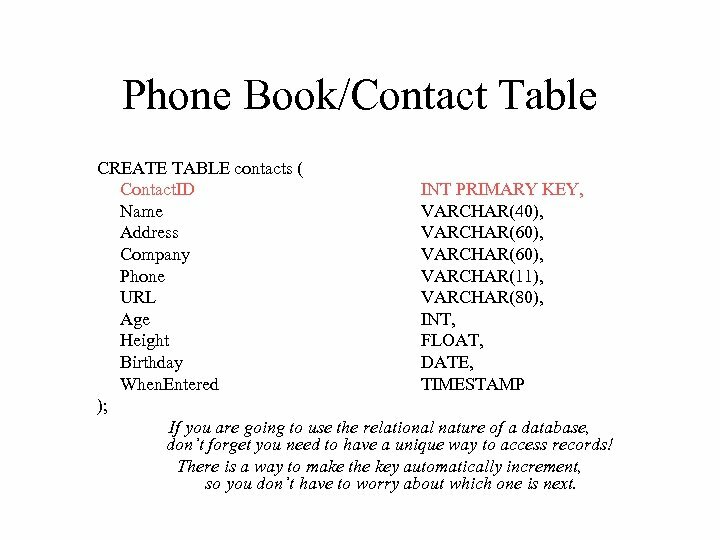 Phone Book/Contact Table CREATE TABLE contacts ( Contact. 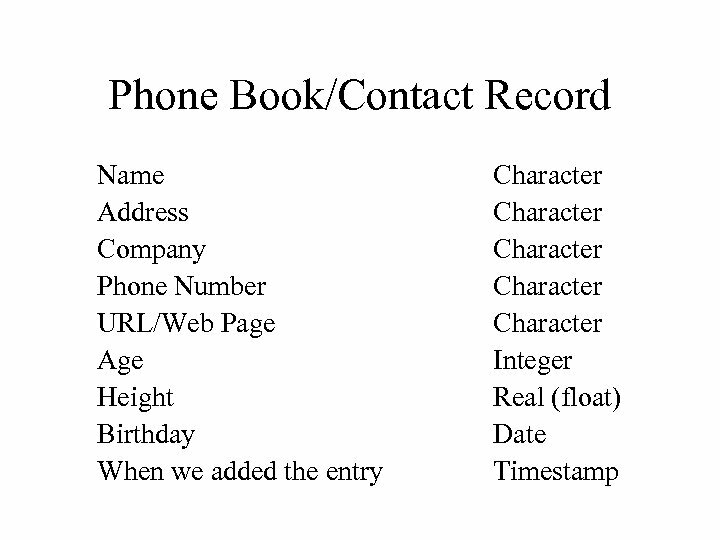 ID INT PRIMARY KEY, Name VARCHAR(40), Address VARCHAR(60), Company VARCHAR(60), Phone VARCHAR(11), URL VARCHAR(80), Age INT, Height FLOAT, Birthday DATE, When. 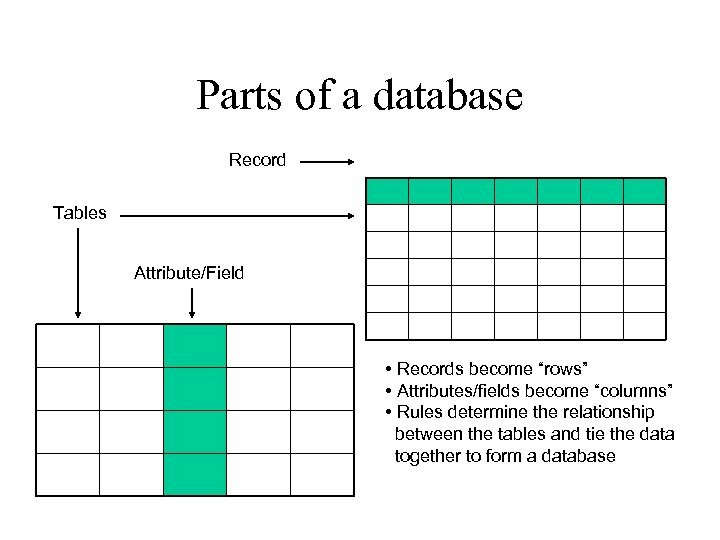 Entered TIMESTAMP ); If you are going to use the relational nature of a database, don’t forget you need to have a unique way to access records! 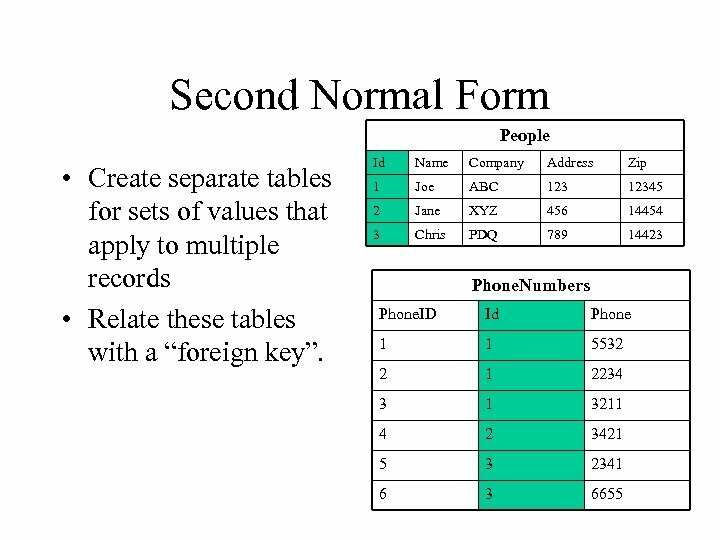 There is a way to make the key automatically increment, so you don’t have to worry about which one is next. 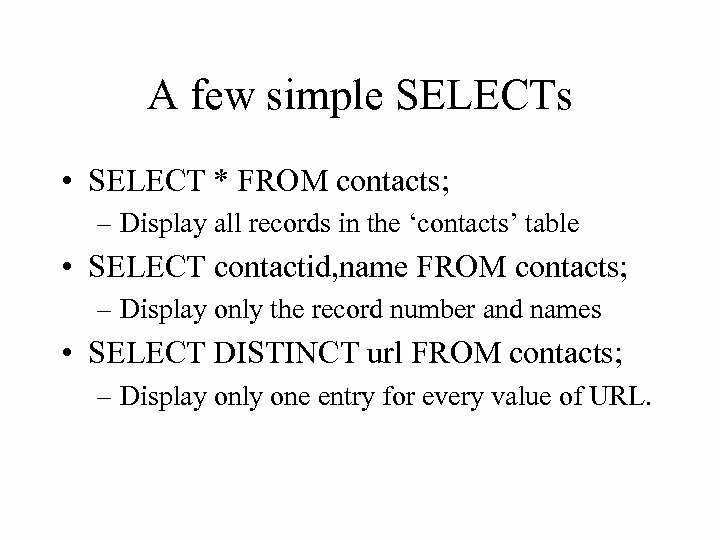 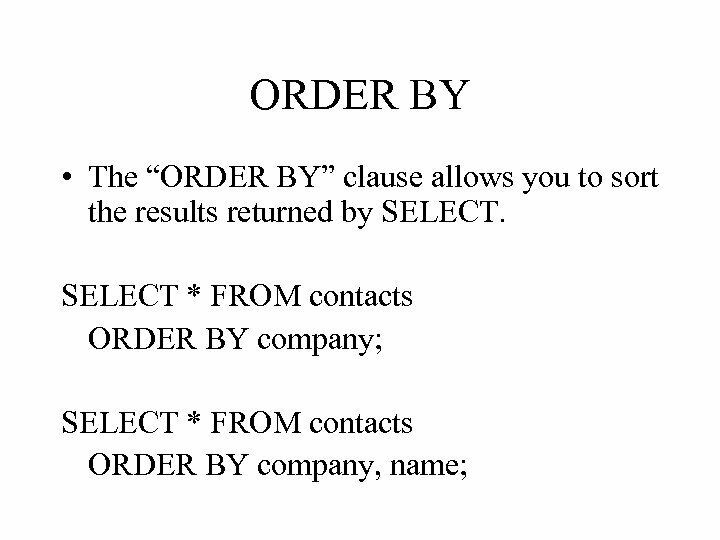 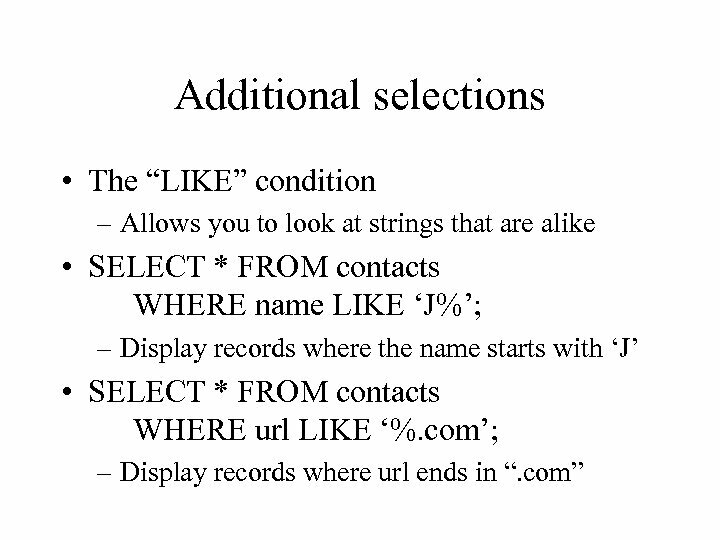 A few simple SELECTs • SELECT * FROM contacts; – Display all records in the ‘contacts’ table • SELECT contactid, name FROM contacts; – Display only the record number and names • SELECT DISTINCT url FROM contacts; – Display only one entry for every value of URL.